Have you ever used a dog bag from one of those publicly available dog bag dispensers often found in parks and high-end private communities? I have and have always thought that it is such a great service provided to the dog community. Even people without dogs benefit from this because it decreases the chances of doggie doo showing up on their yards. I thought: wouldn't it be great if every neighborhood had dog bag dispensers hanging from sign posts and telephone poles? Inspired by my recent read of The Great Neighborhood Book, I decided to do something about it. I purchased a dispenser of dog bags called Mutt Mitts from Intelligent Products Inc. and hung it on the telephone pole right in front of my house (pictured above). Isn't that awesome? Free dog bags for everyone in my neighborhood (Del Rey)! Many people pause and look at it as they pass by. One person has been seen taking a bag so far, and another went out of her way to stop my wife to say "Hey, did you put that up? That's really cool!". I hope the dispenser does its part to keep our neighborhood poop-free and more dog friendly. As long as it doesn't get stolen or vandalized, I plan to keep replenishing the bags. Maybe it'll inspire other neighbors and neighborhoods to add dispensers too. We continued the walks today with a tour of Downtown Culver City. There were 6 of us including a new couple (and their baby girl) my wife met through the popular online Westside family group Peachhead. We all met at the starting point on Washington Blvd and Ince Blvd near Culver Studios. The first sight on the walk was the facade of the studio itself which was a colonial mansion that was part of the famous movie Gone With the Wind. Next, we walked by the Culver Hotel, the triangular brick building in the heart of the newly revitalized downtown area. Our book pointed out that in 1924, many actors from the Wizard of Oz stayed there including the many wild and crazy munchkins. We continued with a stroll down the very short Main St. and stopped for coffee and empanadas at the Argentinian bakery Grand Casino. Leaving downtown, we walked through a quiet residential neighborhood to Carlson Park which served as a good place for a bio-break. From there we continued through the residential neighborhood to Overland and then to the bike path running along the north side of Ballona Creek. Along the creek, I spotted a few California native plants like a Lemonadeberry and a Mexican Elderberry tree. We exited the bike path at Duquesne Ave. and walked across Jefferson Blvd. to Culver City Park. I had been here a few times to visit the Culver City Dog Park, but this is the first time I went on the Interpretive Nature Trail which is an elevated wooden footpath that climbs up the hillside up to a park with amazing views of Los Angeles and the Pacific Ocean. On the way up were many plants and trees some of which were California natives. Again, I saw Lemonadeberry shrubs and Mexican Elderberry trees. The path also passed by a ropes course which a group of kids were using. The rest of the walk was basically to return to downtown Culver City where our lunch at Honey's Kettle really hit the spot. The next walk is Leimert Park Village. Labels: carlson park, culver city park, downtown culver city, walking l.a.
To what extent does transportation factor into the political discourse of the 2008 U.S. presidential candidates? Not surprisingly, the top 3 for public transit as mentioned in the blog post are all Democrats. There is probably more support from the Green Party candidates, but unfortunately the article doesn't mention them. I decided to compile a list of Green party candidate views on transit myself. Listed here are the current Green candidates for 2008. I just read through their campaign pages (except for Jesse Johnson who doesn't appear to have one), and I must say...they are pathetic! I have never seen such crappy web pages before. I spent a few minutes on each site and I couldn't even find a single mention of public transit. Maybe that's why the article above doesn't mention any Greens. Very sad. It has been almost a full year since our last walk, Walk#7 at UCLA. We are happy to resume the walks now that our son is 3+ months old and can join us in a stroller or Baby Bjorn. We drove to the start point of the walk at Washington Blvd and Higuera St. Only one friend joined us this time. She was waiting for us as we arrived 5 minutes after 9:00 AM - probably upset since she had to wake up so early on a Sunday morning and she was the first one there. The walk began on Higuera St. heading southwest through the Rancho Higuera neighborhood. The street had circular rotaries at intersections to help calm traffic since many people used this rode to cut from Washington to Jefferson Blvd. The walk continued north on Hayden Ave through a warehouse area where we were surprised to come upon the Debbie Allen (of Fame fame) Dance Academy. Further down the street were some very architecturally interesting buildings that are part of Conjunctive Points. The Conjunctive Points project will rebuild this under-used industrial area so as to unite the arts, science, and entertainment industries in a visionary mixed-use community of innovative work-space, theaters, exhibit spaces, restaurants, and parks. I had no idea about this initiative until now. We walked inside the Stealth Building (which felt like a Darth Vader spaceship) and admired the modern architecture and views of Culver City. Next we crossed National Blvd and the train tracks that are eventually going to become the the Expo Line. This led to a pedestrian-only entrance into a quiet residential neighborhood which we walked through to get to art deco Helms Bakery complex which has some restaurants (Beacon, La Dijonaise) and the Jazz Bakery all of which I've visited many times. Finally, we turned onto Venice Blvd and passed the furniture stores as we headed back to our starting point. Our book pointed out that you can detect an aroma of candles coming from some candle outlet on National Blvd. We didn't see the outlet, but we did enjoy the pleasant aroma. The next walk is Downtown Culver City. Labels: conjunctive points, culver city, stealth building, walking l.a. In extreme freezing and boiling temperatures of -50° to +400° F.
The pen was originally developed for NASA astronauts. The refill chamber is filled with ink pressurized to 45 psi with Nitrogen and having the consistency of chewing gum. The physical ball used on the point is made to tolerances of 3 millionths of an inch. The R&D costs of this pen were over $1 million in the 1950s! One thing I really like is that the pen is only about 3 inches long with its cap on so it fits easily in my front pocket. With my latest attempts to stay organized Hipster PDA-style, I always need to carry a pen with me. The Space Pen is a good fit for this. Finally! 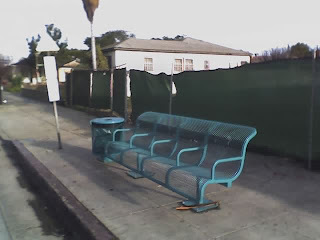 Culver City has installed a new bus bench and trash can on the northeast corner of Washington Blvd and Centinela Ave. I've been waiting for this for years now. I stand on that corner every morning to catch the #14 Santa Monica Blue Bus northbound which is how I commute to work. It is so great to have a place to sit while I wait for the bus. It is also great that people can now throw their trash in the can instead of on the sidewalk. I do wish, though, that they also could have installed a roof/overhang (I don't know the proper name for these things) above the bench so that people can sit there without getting drenched when it is raining. Luckily it doesn't rain all that much in LA. I'm really looking forward to the redevelopment that is supposedly coming soon at this intersection. The plans are highlighted in this edition of the Culver West Neighborhood Association's newsletter. ABC News and Facebook recently added the US Politics application which tracks what's happening right now in the world of politics. As the 2008 presentational race is heating up, there are daily polls for capturing the views of Facebook users. Unfortunately, Facebook is not meant to work with Linux. Please switch to a different operating system for best results on this website. Let me know if you have any questions, and I'd be happy to help. This is pathetic for a website like Facebook that would like to, and probably will, sign up everyone in the world eventually. There are millions of Linux users that they are leaving out by having this policy. Also, support for Linux wouldn't be that difficult to achieve. In fact, I have been using Facebook heavily on Linux for the past few months and this has been the very first problem I've experienced. I wrote another email to Facebook urging them to support Linux users. If you care about the future of Facebook and other large web sites working well on Linux operating systems, I urge you to do the same. To kick off the new year, we went for a neighborhood walk today. It was beautiful outside. A few minutes into the walk, we noticed that it was also very quiet in the neighborhood. We wondered why. Was there less car traffic today? Not really. Suddenly it dawned on my wife: "No one seems to be doing any yard work", she said. That was it! Being a holiday, the gardeners in the area had the day off and most people who do their own yard work seemed to have taken the day off as well. There was absolutely no noise pollution from leaf blowers and lawn mowers! It is amazing how peaceful the neighborhood becomes without all that noise. It got me thinking again about how great it would be if more people would get rid of their lawns which would eliminate the need for all the gas-powered gardening equipment for the most part. All the noise from this equipment has become something we just take for granted. It turns out that many people have noticed this leaf blower noise pollution that is present in many of our cities. Some have called for a ban on leaf blowing like Terra Nova Landscaping and ZAPLA.org, a group of concerned Los Angeles citizens. Some CA cities have even managed to get a leaf blower ban officially approved. If you own property with a yard, please consider evolving your landscaping in a direction that reduces or completely eliminates the need for having lawn mowers and leaf blowers. Try replacing your lawn with a native plant garden. You and your neighbors will benefit from more peace and quiet.